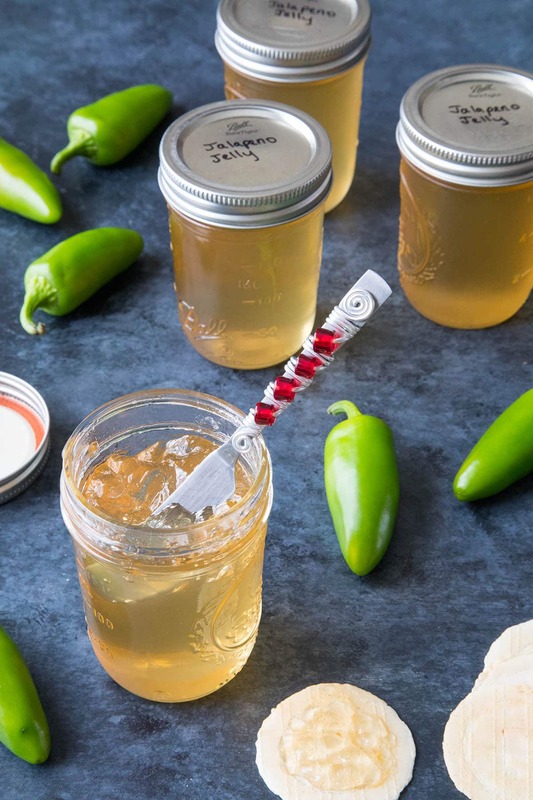 A simple, easy-to-make recipe for jalapeno jelly with sugar, pectin, and fresh jalapeno peppers. Perfect for morning toast but also as a starter glaze or sauce. It’s that time of year! I keep talking about how our garden is basically EXPLODING with chili peppers right now. It’s crazy, but I can’t help myself. I plant so many peppers and the plants produce wildly, especially my jalapeno peppers. Not complaining! Really! Because I have a LOT of ways to preserve my chili peppers so we can enjoy them throughout the year. 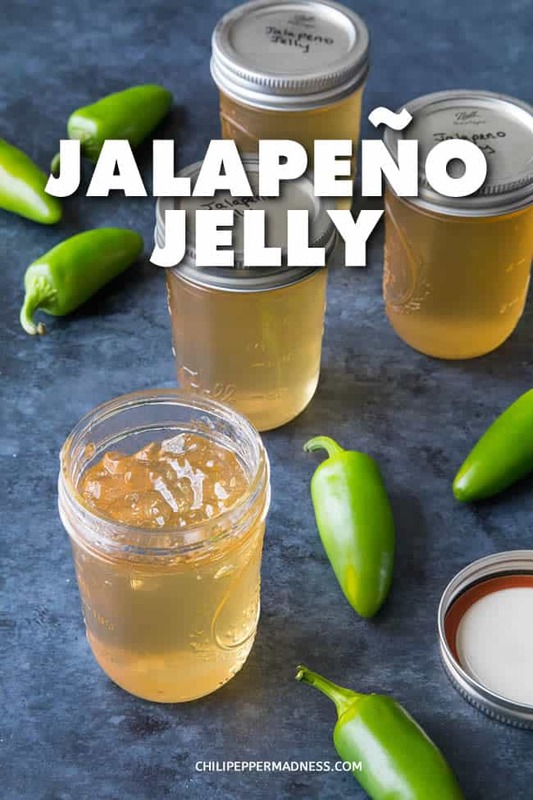 Jalapeno Jelly is one of those ways. This jelly is nice and sweet and works as a simple spread for crackers or breads or toasts. It’s a flavorful snack and pairs perfectly with cream cheese. It also works for me as a super quick sauce for grilled meats, like chicken or fish. Seriously, sear up a chicken breast or some seasoned white fish and finish them off with a tablespoon of this. You can also use your own homemade jalapeno jelly as the start of a glaze for those very same meals. So much of the work is already done! I used to shy away from making jellies and jams. I always thought they were hard to make, but it is SO not true. It’s super easy once you give it a go, and it’s pretty foolproof. 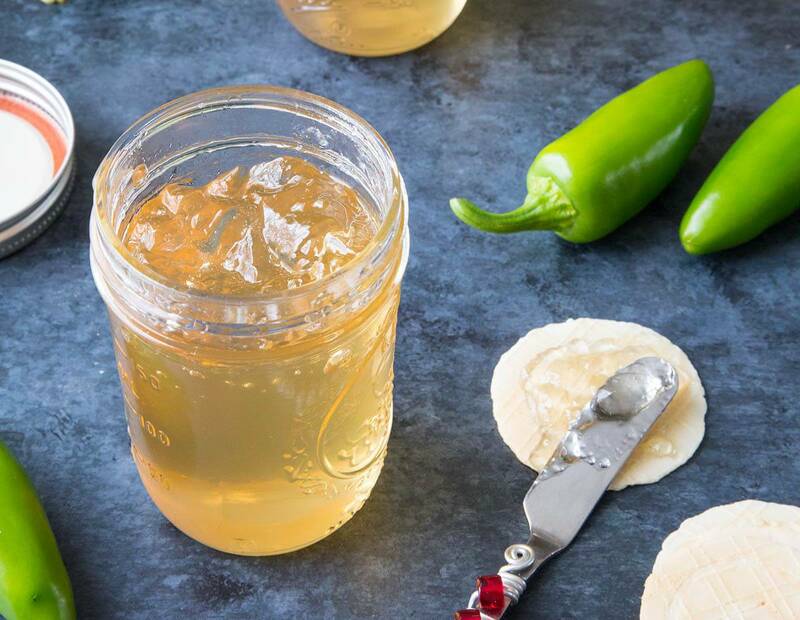 One last thing – Jalapeno Jelly makes for a perfect gift. Housewarming party? Holidays coming up? Bring them a jar or two of this. They’ll love it! Let’s talk about how we make this jalapeno jelly, shall we? First, finely chop your jalapeno peppers. Start with a half pound of them. Add the peppers to a large pot. Next, add 4 cups of sugar. Yes, this is a sweet jelly recipe. 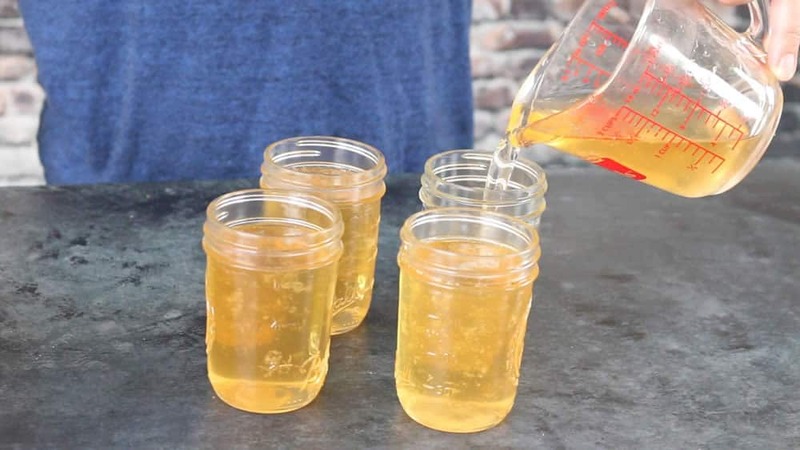 Pour in 1-1/4 cups apple cider vinegar, 1/4 cup lime juice, and a teaspoon of salt. Next, bring to a boil over high heat, then reduce the heat and simmer it for about 10 minutes to let the flavors develop. After 10 minutes, pour the contents into a different pot, then strain it back into the original pot. Make sure all of the solids are removed. Pour in 3 ounces of liquid fruit pectin. Bring the liquid back to a boil, stirring a bit, and boil for 1 minute. Pour or ladle the hot liquid into 4 clean 8-ounce jars, like so. Screw on the caps and refrigerate overnight. The jalapeño jelly will set over night, though it could potentially take up to 2 weeks to fully gel. I keep mine in the refrigerator and eat them within a month or 2, but if you’d like to keep them for longer and/or want to store them at room temperature, you can process them in a water bath. See information on that below. Wear rubber gloves if you’re concerned with feeling the burning sensation peppers can cause. If you do feel the skin burn, see How to Stop the Chili Pepper Burn. You can also use a food processor to more finely chop the peppers. Just don’t over process them, or you’ll get a mush. 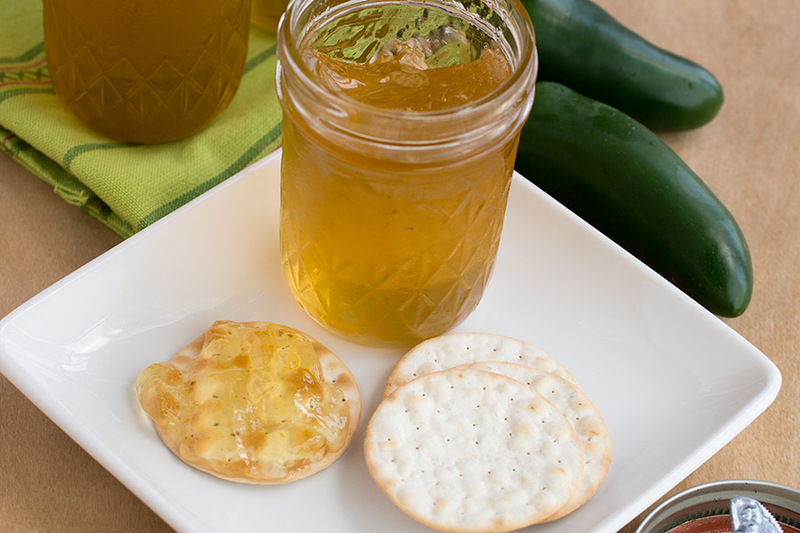 A favorite is always crackers with cream cheese and jalapeno jelly. It’s just such a great flavor combination. You can use it in place of just about any other jelly you might use. I personally love it as a glaze or starter glaze for both chicken and fish. Just brush a bit on after grilling for a wonderful sweet and spicy flavor boost. Here are answers to some questions I get on making jellies and jams. Properly sealing jellies and jams is important for longer keeping. To do this, use pint jars that have been cleaned with soap and water, then held in hot water until you’re ready for jarring. Or, you can sterilize the jars by boiling them in hot water for 10 minutes. Add 1 minute of boiling time for every 1000 feet of altitude. Set them into hot water while you prepare your jelly or jam. Wash and rinse the bands and lids. Next, prepare the boiling water canner or pot with enough clean water to cover the jars by at least an inch or 2. Bring the water to 180 degrees F. Just under a boil. Pour the hot pepper jelly or jam into the sterilized jars, leaving 1/4 inch of head space. Wipe the jar rims and screw on the cleaned rings bands and lids. Place them onto the canning rack, ensuring the jars are 1-2 inches below the water. Bring the water to a boil and boil for 5 minutes, or 10 minutes if you’re not using sterilized jars. Add an extra minute per 1000 feet elevation over 1000 feet. Remove the jars and set them onto a protected surface. Water bath processing super heats the air at the top of the jar, effectively killing any spores or yeast from the air, as you don’t want to seal those in with lower sugar jams. The method also makes for a stronger seal than simply letting the jelly or jam cool and pop. Don’t move the jellies or jams for at least 12 hours after you’ve made them, or you risk breaking the gel. After proper cooling, check the seals and store in a cool, dry place. Your jellies and jams should last a year this way, but the flavor is still best if used within a few months. Add the jalapeno peppers to a food processor and pulse them until they are very finely chopped. Do not overdo it or you’ll wind up with a puree. Scoop out the peppers and add to a large pan. Add sugar, vinegar, lime juice, and salt. 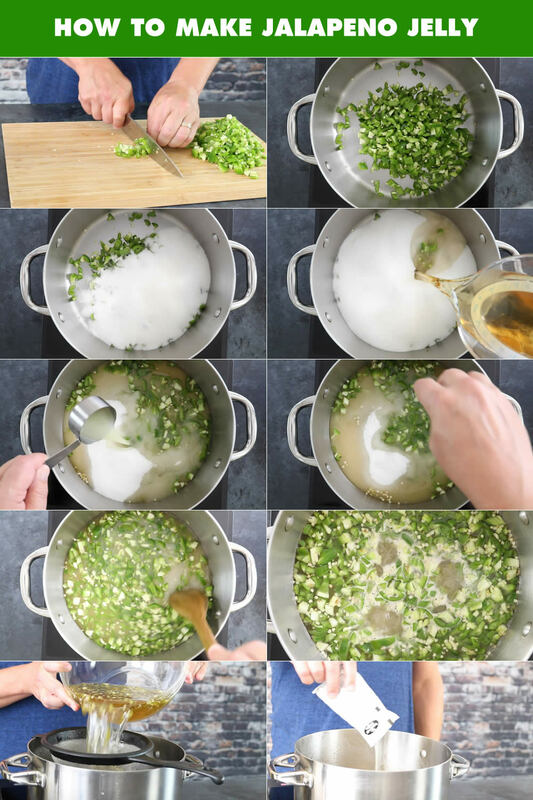 Strain out the jalapeno peppers and return the mixture to the pan. Return heat to high and bring liquid to a boil. Stir in pectin and boil for 1 minute, stirring constantly. Remove from heat. If using food coloring, add it now and stir. Ladle the hot liquid into clean jars and screw on the lids. Cool overnight in the refrigerator. The mixture will solidify into jelly. Yields about 4 half pint (8 ounce) jars. This recipe was originally posted on 9/21/2015, updated on 10/2/18 to include new photos and a video. Jim, I used Apple Cider Vinegar, though any vinegar will do. Yes, you can reduce the sugar, but not by too much as the recipe could fail. Thanks for commenting! I stem & seed the jalapenos, process them in a Cuisinart, and do not strain out the solids. I always use a water bath process per the Bell canning book. The stuff keeps in the basement virtually for ever. I recently used some from 2012 as part of a pork chop marinade and dipping sauce. Since I’m nearly out of jelly, I’m going to try using fresh Fresnos, fresh Poblanos, and frozen Jalapenos. I’ll be back with the results when I’m done. That’s awesome, Jim! If you don’t strain, it is technically a “jam”, but who cares?! It’s delicious that way, too. I have a lot of jam recipes on the site. Looking forward to hearing your reaction. Seriously. I have considered using the Cuisinart on the goose berries in the freezer and straining them for the juice to make jelly. May have to do that, too. Haha, yes! I think your idea sounds perfect! Looking forward to the results! OK, I had a pound of green Jalapenos, half pound of ripe fresnos and 2 habaneros (decided anagins the poblanos at the last minute since I had so much of the other peppers). Ended up with 12 half-pints that were cooked 10 minutes in a water bath plus a pint left over that went into the fridge. Did a double recipe for jalapeno jelly (that’s what they call it!) straight out of the Ball Blue Book. In retrospect, I wish I had used more habaneros, but after tasting the fresnos thought there was going to be plenty of heat. Turns out there wasn’t as much. There was enough, and it was the kind of heat I strive to get: Heat at the finish at the back of the mouth. Also got a bit of tingling on the lips. All in all, it was a success. Question – are the jalapeño peppers seeded? Danya, I usually don’t seed the jalapenos, as they are strained out anyway, and I like to retain the heat (not from the seeds, but from the innards). However, some people report some bitterness from seeds, so you can remove them if that is a concern. Bear in mind that scooping out the insides will remove most of the heat. FYI. How long should the jars be in a water bath if canning? REPLY: Cristina, 10 minutes is usually sufficient. — Mike from Chili Pepper Madness. This recipe is so good! I’ve made it twice now, and turned out perfect each time. About how much does this yield? REPLY: Mike, this should yield you 3-4 half pint (8 ounce) jars. — Mike from Chili Pepper Madness. REPLY: Heather, the recipe doesn’t call for water. — Mike from Chili Pepper Madness. 1/2 pound of Jalapeños is approximately how many cups of chopped peppers? REPLY: James, it’s about 1 cup. — Mike from Chili Pepper Madness. REPLY: Rita, jelly can last a year pretty easily in the fridge. — Mike from Chili Pepper Madness. Not enough sun in the UK this year so my Chilli and Jalapeño peppers weren’t so good. I pulled up the Jalapeño plant and stripped the peppers off it. Now what to do? I found this recipe and gave it a go. Thank you very much. Love the jelly. At 81 we can still find new things to do. Once I make it then I will give more feedback.